Saturday: 11:00 a.m. - 4:00 p.m.
Every 20, 40 and 80-person Rental Suite includes tickets, parking passes, the choice of two delicious food and beverage packages, an open bar and dedicated attendants. Please note pricing is subject to change based on availability. For more information on renting a suite, please contact us at (312) 455-4119 or (312)-455-4577. If you are interested in reserving a Rental Suite that is not listed below for this specific event, please contact us to be added to the waitlist. As America's Premier Sports and Entertainment Venue, the United Center provides the best in food service, presentation, and quality. Levy Restaurants looks forward to creating a memorable experience for you and your guests. Find fan favorites served up with 7 different beers, 2 plasma TV screens and great sandwiches on the 300 level, across from section 309. Eat in our casual seating area overlooking the Chicago Skyline. Sample a fresh-carved sandwich or specialty beer at the Goose Island Pub before, during or after any game. Features live music before the game. Located across from section 108. Take I-90 East to the Madison Street exit and make a right onto Madison Street. The building will be on your left. Take I-55 North to the Damen exit and make a left, going northbound for approximately 7 minutes. The building will be on your right. Take Madison Street west from the Loop. Take I-290 East to exit 28A (Damen Avenue). Take Damen Avenue north to Madison Street. Make a right onto Madison Street and the building will be on your right. Take the Orange, Green, Purple, or Brown lines to Madison. Take #20 Madison buses west. To the United Center: The #19 United Center Express Bus runs on game days. Service begins 90 minutes prior to game time, runs every 10 minutes until 30 minutes until start of game. Board at stops starting southbound on Michigan and Randolph. Connections are made with Metra trains at Millennium Station, Ogilvie Center and Union Station. The #20 Madison Bus travels west on Madison Street, starting downtown at Wabash Street and runs every few minutes, making all stops to the United Center. From the United Center: The #19 United Center Express and the #20 Madison buses run every few minutes, departing from the eastbound side of Madison Street. Buses make all stops. Visit the Chicago Transit Authority's website, transitchicago.com for more information. All official United Center parking lots are conveniently located near the arena and can be accessed from Damen Ave., Madison St., Adams St., Warren Blvd., Wood St., Monroe St., and Washington St. PLEASE NOTE: Parking lots open to public two hours prior to event time. All prices are subject to change without advance notice. The United Center offers free parking for select family shows in all official United Center parking lots. All Parking Policies outlined below remain in effect. 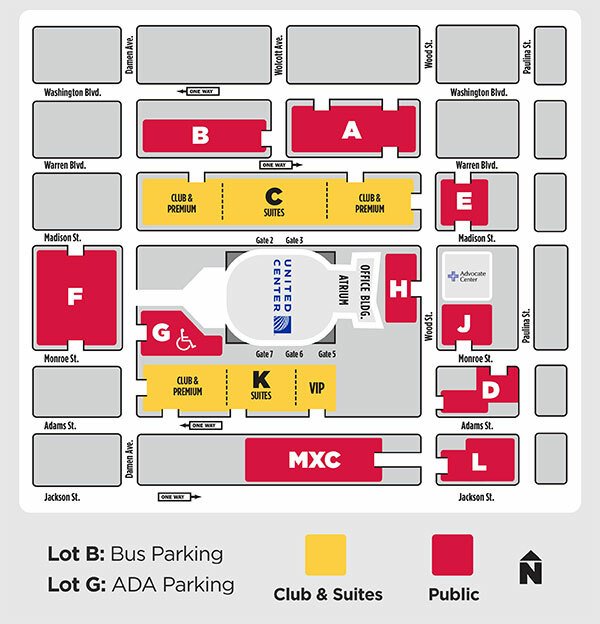 For details on handicap parking, please see the United Center Accessibility Guide. EV Charging Stations are available in Lot H and Lot K. Charging is free. Please be courteous and maintain parking/charging for the posted time limits. No overnight parking unless related to event activites and approved in advance. No consumption of alcoholic beverages on lot or in parked vehicles. No tailgating or similar activities. Two reserved parking passes will be valid in lots C and K. The other two reserved parking passes will be for parking in lots A, B, D, E or L. Holders of these passes will be directed to A, B, D, E or L lots by traffic police and parking attendants based on traffic conditions. Parking passes are good for one space each. Please attach parking pass to the rear view mirror of your car to allow traffic police and the parking attendant(s) to recognize you as an Executive Suite Holder. For all special events, each Executive Suite Holder will receive two complimentary parking passes per event ordered. These two passes will be for reserved parking located in lots C and K. In addition, Executive Suite Holders will also receive the option to purchase four additional parking passes in lots C and K for special events. Suite Holder parking passes are also valid for buses or limousines under specific guidelines. Lexus Club Seat members have reserved parking in fenced, well-lit and clearly marked parking lots adjacent to the United Center for all Blackhawks or Bulls preseason, regular season and playoff games. All Lexus Club members who purchase tickets to other events may also purchase one preferred parking pass (in lot C or K) for such events. Details on how to obtain parking for other events are included with the fax transmission announcing each event. Lexus Club Seat members with two to four tickets receive a complimentary, reserved parking space in a closed-in, paved lot for all Blackhawks or Bulls preseason, regular season and playoff games. Lexus Club Seat members with five seats or more will be provided with two parking passes.